Digiflavor Aura RDA Review - Daily Vaping Deals & The Best Vape Product Reviews at Vaping Cheap! Digiflavor has collaborated before with YouTubers to create an atomizer, such as the Pharaoh RTA and Dripper Tank. They’re now back with a collaboration, but this time with DJLsb Vapes and have released the Aura RDA! This atomizer is quite unique in design, and offers both adjustable bottom and side airflow, offering multiple airflow configurations alongside a step clamp build deck which allows for easy coil installs. This atomizer is available in three different color options which are Stainless Steel, Black and Gold. Before getting any further we’d like to thank Efun Top and 3avape for sending this atomizer our way for the purposes of this review. We’ll go over our first impressions, building and wicking, performance, pros and cons, and conclude with whether or not we recommend the Digiflavor Aura RDA! 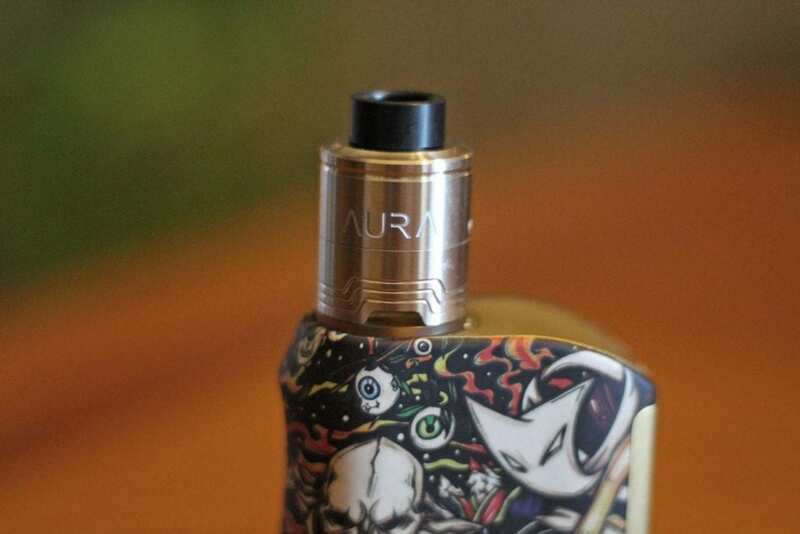 Click Here to Check Out The Aura RDA! Upon first receiving the Aura RDA by Digiflavor and DJLsb Vapes, I immediately noticed the familiar packaging from Digiflavor. Now, do keep in mind that this is the sample packaging, and from what I understand the packaging will differ with the final retail version. Even if this was the retail packaging, I wouldn’t mind it since it is quite simplistic and keeps everything within very safe during transit just like other Digiflavor products we’ve received. Once you slide open the box, you’re greeted with the Aura RDA and an additional 810 drip tip. What else is included with this atomizer is a large heavy duty Phillips screwdriver key (which is much better than the blue screwdriver we all know), additional screws and o-rings, a pair of Clapton coils, a squonk/BF 510 pin, 2 coiling rods (2.5mm & 3mm diameter, the retail packaging will include 2 of each), a 510 drip tip adapter and user manual (included with retail packaging). It’s definitely a huge pro that they include a ton of extras, this is something I love to see with new atomizers. The Digiflavor Aura RDA is 24mm in diameter, and is primarily constructed of stainless steel. Like mentioned previously, it does feature adjustable bottom and side airflow. I personally love bottom airflow RDAs, since I do get some of the best flavor from this style of airflow. Even if you didn’t like bottom airflow, you can completely close it off and just have the side airflow open. This atomizer is designed with a top cap and mid cap. The top cap allows you to adjust the side airflow, and by turning the mid cap, you can adjust the bottom airflow. Another unique feature to this atomizer is the PEI or Ultem Heatsink or disc at the bottom. This allows for heat dissipation so your mod doesn’t get hot while vaping. Definitely a nice touch overall. Both of the included 810 drip tips included with the stainless steel version is delrin. The same can be said for the black color option, but the Gold version includes an Ultem 810 drip tip. The included drip tips are of different sizes, so depending on your preference will determine which you like best. Of course, you can use your own 810 drip tip or 510 drip tip utilizing the included adapter. The overall quality of the Digiflavor Aura is really good, but the bottom of the mid cap where the bottom airflow cutouts are, are very sharp. This is a con, but I’m sure in the retail version this would be something they would fix. The o-ring tolerance for the top cap is pretty good, but the mid cap o-rings are quite “spongy”. This is also something I’d expect them to fix in the final retail version. All in all, my first impressions of the Aura RDA was great. The only drawbacks I found were the sharp edges on the bottom of the mid cap and some of the o-rings. Nothing major to be honest, and I do like the design of this atomizer, it really is a good looking RDA. Building and wicking the Aura RDA is pretty easy as you’d expect with any clamp style design. This one is a bit easier though to build on in my opinion in comparison to some other clamp style decks. There are small bevels in the posts, so it makes it easy for your leads to lift the clamp and be inserted. In addition, since this is a “step clamp build deck”, it is staggered; therefore your coil lead that is wrapped over will slide into the higher post slot, and the lower coil lead will naturally fit into the lower post slot on the other side. This is a great design, since it allows for the cotton to not be blocked by the coil itself. With some other build decks that’s similar, the coil lead would sometimes interfere with cotton, with this atomizer this won’t be an issue. When installing your coil build, be sure to take a look at the bottom airflow slots. Each bottom airflow slot is raised and slightly angled, so it’s best to bend your coil downwards to sit right on top of the bottom airflow. Just make sure when you are installing your coil that the coil itself does not touch any metal as this would cause a short. Something else worth mentioning is the screws included are nice and beefy. In addition, the included screwdriver and coil rods really do help with the coil install process. I was easily able to install various coil builds in this RDA such as Fused Claptons, Triple Core Fused Claptons, Staggered Fused Claptons and Aliens. So if you’re a vaper who likes bigger coil builds, you’ll be happy to know that this RDA will easily accept most of these larger builds. Simple round wire builds can also be installed with no issues. Wicking the Aura RDA is pretty easy as well. The juice well is narrow, but quite deep. Since this is the case, you’d want a little bit more cotton than normal. I measured how much cotton I need by simply pressing the cotton towards the build deck and cut the cotton right where the Ultem heatsink is located. Once you cut your cotton, be sure to fluff them out with a tweezer or something you prefer. Afterwards, simply tuck your cotton into the juice well, and be sure that there is no cotton interfering with the bottom airflow as this could cause the airflow to become turbulent or may cause leaking. With all that being said, build and wicking the Digiflavor Aura RDA is pretty easy and I’m sure the beginner and advanced user will have little to no issues with it. The step clamp build deck and small bevels make it so that coils slide into place easily, and the juice well is fairly deep, so you can stuff a good amount of wick. Now the biggest question of this review is how does the Aura perform? Well, I can easily say this RDA has fantastic performance! Firstly, I will mention my preferred coil build which was a dual Fused Clapton which had a resistance of 0.18 ohm. This coil build would work well on both mechanical device and regulated vape mods. On a regulated device I would vape this coil build between 60w and 80w. With this wattage, I would get a warm and flavorful vape. As mentioned previously in this review, this RDA has adjustable bottom and side airflow. You can easily adjust the bottom airflow by turning the mid cap, and adjust the top airflow by turning the top cap. With both of the airflows wide open, the draw is a bit on the airy side, but has some restriction to it. The flavor was good this way, but the flavor became much better when I closed the side airflow completely. Of course with the side airflow closed off, the draw becomes a bit more restricted, but this is something I prefer and enjoy. The airflow is not too restricted with the bottom airflow only. However, with the bottom airflow closed and the side airflow wide open, the airflow is a bit more restricted in comparison. The flavor is not as great with just the bottom airflow open in my opinion, but it’s still good nonetheless. The top cap is domed and features a conical design as well, which certainly helps with the flavor. The airflow on this RDA is incredibly smooth, and I was quite impressed by it. However, when you do close off the side airflow half way or more and have the bottom airflow open, it can get a bit noisy. It’s still very smooth, but just a little noisy. Not really a big deal in my opinion since it’s not terrible by any means. The vapor production is very good as well off of the Aura RDA. Of course, this would depend on your coil build and so on so forth, but the vapor production I would get with my preferred coil build was more than satisfying. I expected this RDA to have really good flavor due to the bottom airflow. Now, just like any other bottom airflow RDA if you do over drip, you will get leaking. However, I was able to easily drip 15 to 20 drops of e-liquid right through the wide bore 810 drip tip and not experience any leaking. With how the clamps are designed, when you drip e-liquid it goes where it needs to without going into the airflow hole. Now if you drip a ton of e-liquid, then you’d probably get some leaking. I find that “painting” my coils was a good way as well. Since the bottom airflow is a bit raised and angled, it does help prevent leaking. The Aura RDA also includes a squonk 510 pin as well, so you can use this atomizer with any of your squonk box mods. 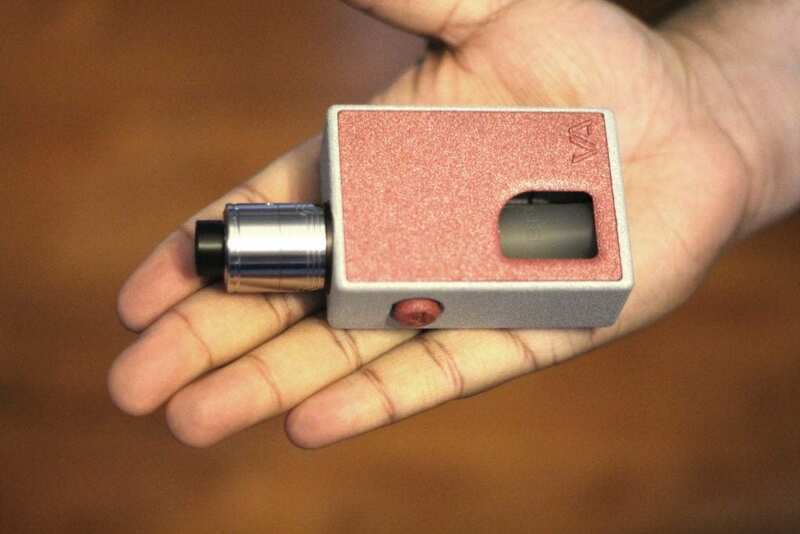 Now do keep in mind, if you’re squonking with this RDA, do not over squonk as you will get leaking. I find that two or three presses of my squonk bottle and this RDA was good to go and I could take a good 10 to 15 hits before needing to squonk again. Something worth mentioning that is related to leaking is that e-liquid tends to get around the o-ring of the top cap. So if you take your top cap on and off to drip or paint e-liquid, when you go to put on your top cap, it sometimes pushes e-liquid out onto the sides of the atomizer. This isn’t a huge deal, but still something to be mentioned. In addition, the o-rings at the base of the RDA could be a lot better. One last thing to mention is that this RDA does not support single coil builds. While this isn’t a big deal for me, it might be for some of you vapers out there. All in all, the performance of the Aura RDA by Digiflavor and DJLsb Vapes is excellent! The flavor I got from this RDA is excellent, and I had no real cons to be mentioned when it came to the performance. In conclusion, the Digiflavor and DJLsb Vapes Aura RDA is a solid performing RDA that has amazing flavor and vapor production. It’s a huge pro that they included all of the extras such as the coiling rod and beefy screwdriver, and simple things like this really sets it apart from other atomizers since it adds some value. In addition, building and wicking is a breeze, and even if you didn’t like bottom airflow you can simply cut it off and have just the side airflow open, making the Aura quite versatile. There were a few cons to be mentioned, and most of them weren’t a big deal in my opinion and some can or will be fixed in the retail version such as the o-rings and sharp edge. Of course, with any bottom airflow RDA if you do over drip you will encounter leaking, but the trade off is the excellent flavor you get from it. I didn’t experience any leaking unless I over dripped, and in that case it’s my own fault. However, as mentioned previously, I could easily drip 15 to 20 drops of e-liquid right through the drip tip and I was good to go. The best way with bottom airflow is to simply “paint” your coils, as this will ensure zero leaking. Even though these cons were mentioned, the pros completely outweigh them and I thoroughly enjoyed using this RDA. The flavor is top notch, and building is a breeze. If you’re looking for a solid bottom airflow RDA that includes a Squonk 510 pin or simply looking for a good all around performer, then the Digiflavor Aura RDA is definitely one we recommend. 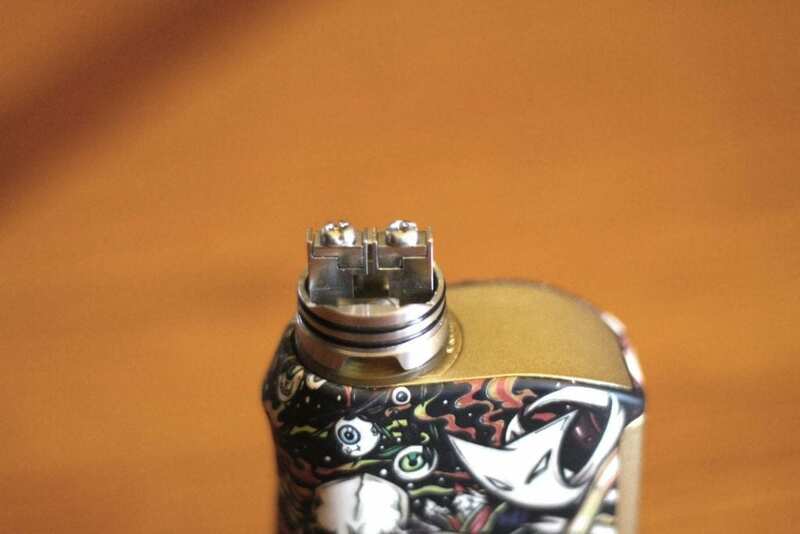 Had you try simple round wire (24awg) with this rda? What setup work best? How is the flavor?